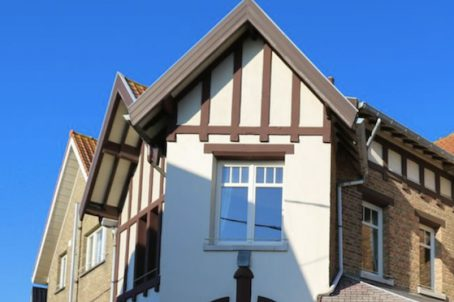 Charming Coast Hotel/b & b consisting of 8 tastefully renovated rooms, bicycle café, breakfast and lunch room, professional kitchen and summer terrace. Good growth figures: room occupation rate as turnover. Good reputation on booking sites. Turn Key opportunity! Possibility of developing Restaurant activities without additional investment. Hotel building and private residential building is included. The enterprise is located on the Belgian coast and was formerly a flourishing business that was operated till the end of 2016 by two older people. They exploited the catering business over 23 years as Hostellerie. A classic restaurant with Hotel. During winter 2017 the commercial ground floor (formerly restaurant and breakfast room) , the reception and the surrounding of the building where completely refurbished and brought back to contemporary standards and comfort. By the end of 2017, all hotel rooms and the toilet room where renovated and redecorated. Since then, the hotel is succesfully operated as Hotel and breakfast -luchroom. Since the renovation, the company is a strong grower in turnover and hotel occupation rate and has untapped potential. at noon, a limited lunch menu is offered with snacks and salads. During the afternoon people can enjoy coffee and pastries. Besides tourists, the operations can count on local customers. After 7 PM the operations is closed. The renovated hotel comprises 8 rooms have a sun terrace with capacity for 60 people, two renewed rooms that can accommodate 36 people, a professional restaurant kitchen, cellars, renovated toilets and two smaler buildings that currently serve as garage and storage space. Above the commercial ground floor, is an (not renovated) privat appartement with: an Office; two bathrooms; a living room; a kitchen room; storage room and three bedrooms. The acquisition consists of the acquisition of the company. The company contains an operational hotel with a catering facility and the renovated property. -Operate as pure B & B or Hotel bar etc.